This is really easy and takes no time at all as long as you have a heat resistant pot for the top of the oven. You can walk away and leave it whilst it is simmering and get on with your other chores. If you are entertaining adult guests, you can add some chilli powder for more of a kick. Curry paste added also gives this dish a different dimension. You can add as many vegetables to this dish as you want such as flageolet beans or chickpeas etc for a bit more fibre, but only add these cooked vegetables to heat through before serving. 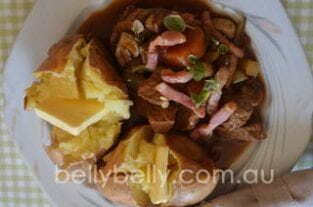 Did You Enjoy Our Beef Casserole Recipe Or Have Your Own Tips? Olive oil " 1 to 2 tbs. Place a 'glug' of olive oil into a large heatproof casserole dish or big pot with lid, and cook the onions, leeks, garlic and carrots to soften, but not brown. Add the mushrooms and cook for a few more minutes, stirring to prevent sticking. Remove all the vegetables from the pot, and add a little more olive oil, a little flour and place the meat in to brown, stirring to coat the beef and seal in the juices. Add a little seasoning to taste. Bring up to the boil and leave to simmer for 1hr and 30 mins, with the lid on. Check during cooking that the meat is not sticking to the bottom of the pot. Test the meat for tenderness, and if still not ready, continue to simmer for another 30 mins, again stirring to prevent sticking.